The December RAST meeting at Sena Place Hotel welcomed both newcomers and several familiar faces -- overseas members who were visiting Thailand, escaping cold weather in north America or Europe (with reports of snow falling in New York, according to John, W2YR/HS0ZDJ). Another "old-timer" was Lyle Greeno, (W4OMK/HS0ZAM) and his XYL Orn from Florida, USA, while newcomers included Glen, W1GFX, and his XYL Trane, as well as Stig, OZ3ACH, and his XYL, from Copenhagen,along with E21RTE who is President of the Bang Na Sampun amateur radio club. After introducing himself, E21RTE announced that his association would be celebrating its 15th anniversary on January 30, 2010 with a party at the Queen Sirikit National Convention Centre and that RAST members were invited to participate. Seats for the banquet are 300 baht each and RAST President Chaiyong Wongwuticomjon, HS1QVD, announced that RAST was sponsoring a table for 10, while more details (in Thai) can be found at this website. From left, Yannee, HS1LCC, Mayuree, HS1YL, Thida, HS1ASC, Chaiyong, HS1QVD and Gen Prasit, HS1DN. Before the announcements were made and after the introductions, everyone was asked to stand for one minute to mourn the passing of RAST life member HS1SUC, Wichien Numjirawat, who became a silent key on December 5. Chaiyong then announced that on November 26 he and RAST officers Mayuree Chotikul, HS1YL, Gen Prasit, HS1DN, Yannee, HS1LCC, and Thida, HS1ASC, had attended a memorial service at Wat Bovornniwet for the late Samak Sundaravej, a former Prime Minister who had held many senior government positions before that, including the post of Minister of Communications at the time that legislation to govern amateur radio was under consideration in the early 1980's. It was some 25 years ago that Samak had presided over the 20th anniversary celebrations of RAST in 1984 when he had given a long and rousing address, pledging to support amateur radio and speaking of its many benefits. May both Wichien and Samak rest in peace. At the beginning of November, RAST had sponsored a kathin merit-making expedition to Wat Donkaew, Lampang, in which RAST President Chaiyong had participated, and those present at the December meeting heard that this had raised 900,000 baht in donations. In October 2010, three commissioners of the National Telecommunications Commission (NTC) are due to retire and replacements are to be appointed. The NTC is shortly to select a screening committee that will vet the candidates and decide who these commissioners will be. During the RAST committee meeting that preceded the December 6 meeting, officers agreed unanimously that RAST President Chaiyong Wongwuticomjon should be formally proposed to serve as a member of this screening committee, and his name will be submitted for consideration to the NTC before the deadline set for later this month. On Dec 4, on the eve of His Majesty the King's birthday, a special 2-metre net was arranged when radio amateurs offered blessings over the air to His Majesty the King. A total of 215 check-ins were recorded. The RAST New Year's party will be celebrated at Maj Narissara's (John's) Vibhavadi Rangsit Soi 60 QTH (the same venue as last year's party) on Sunday January 10, 2010. Members and guests, including any visiting hams, are welcome from 4 p.m. onwards. A buffet dinner will be available, along with refreshments. All who attend the party are asked to bring a wrapped gift with a value of not less than 300 baht to be exchanged with other gift-bearers in a lucky draw during the evening. A map to the party location can be found by clicking this link. Directions to the party venue: (From central Bangkok) Drive north towards Don Mueang airport along Vibhavadi Rangsit Highway and keep to the left-hand lane as you approach Chaeng Wattana Road. Continue underneath Chaeng Wattana overpass and take the U-turn bridge, after which you should keep to the left-hand lane as you return in the direction of Bangkok. 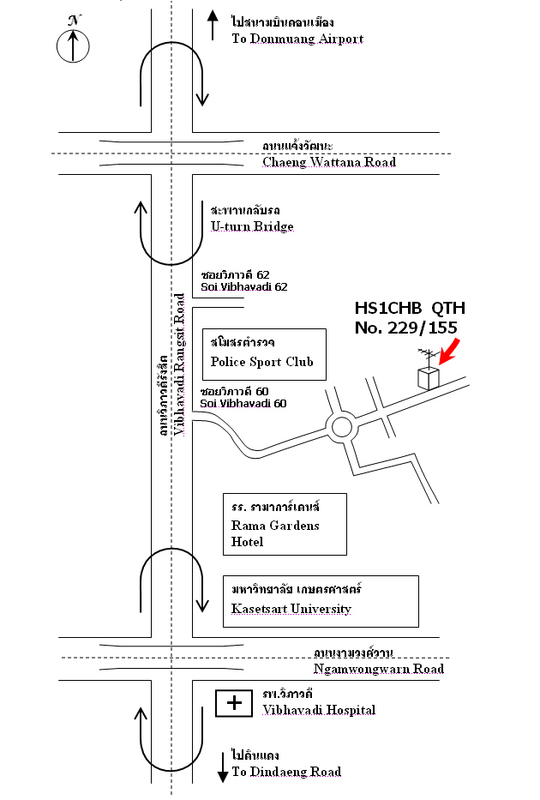 Vibhavadi Soi 60 is just past the Royal Police Sports Club (the venue of RAST's 40th anniversary in 2003). Once in Vibhavadi Rangsit Soi 60, follow the soi in and continue straight at a circle/roundabout. After crossing a small intersection, HS1CHB's 5-storey white building (with HF antenna on the roof) is on your left, #229/155 If you have Google Earth installed, right click and then select "save as" to download this link; then click on the "open" option in the download menu and in a matter of seconds Google Earth will "take you there" for a bird's eye view. Chaiyong announced that RAST had received a formal letter from the NTC notifying the society of the approval of the expansion of the 7-MHz band by an additional 100 KHz to encompass 7.0-7.2 MHz, as agreed at the WRC-03 conference in Geneva. In other correspondence from the NTC, RAST has been informed that its request to conduct an intermediate class training session and examination has been received and is under consideration and that the society can expect to receive a reply in due course. Many enquiries had been received asking about the dates and locations of the novice class training and examinations for 2010 and details can be found below of a total of 19 events throughout the country, including Bangkok, over the next 12 months, along with contact information. HS0AC station manager also gave a round-up of activities during November from the club station, with the highlight being 1,019 QSOs during the CQ Worldwide CW contest, and on behalf of he thanked Reiner, HS0ZEU for helping to repair the Yaesu FL2100. It was also announced that Narissara, HS1CHB, would seek a special dispensation from the NTC for children under the supervision of licensed amateurs to take the microphone or a Morse code key to be able to operate amateur radio demonstration stations during Children's Day on Saturday, January 9, 2010. Charly, HS0ZCW, proposed that the society should seek a special callsign "E2E" for club contest activity while Kamol, E21EHQ, who is also a pilot, asked that RAST seek two experimental frequencies on UHF (in the 70-centimetre band) -- one to permit APRS data and the other for voice, to allow APRS trials to be conducted by radio amateurs using private aircraft. RAST agreed to consider both proposals, and asked Kamol to help prepare the details for submission to the NTC. In other developments, the date for the proposed car rally to Kanchanaburi has not been finalised yet, and Chaiyong announced that the event may now take place in March, while RAST Vice President Gen Prasit, HS1DN, was interviewed by Matichon recently about the time that he had three QSOs with HS1A, His Majesty the King, some 25 years ago. The text in Thai of the interview can be found on the Web at www.hs3lzx.in.th. Here's wishing everyone a very happy, healthy and prosperous New Year. Let's hope the new sunspot cycle begins to pick up in the coming year, bringing better propagation and with it more DX signals. The formal part of the November 2009 meeting of RAST at Sena Place Hotel began with one minute's silence for two members who died in October. Mike Wallace, HS0ZHS/NK2R, succumbed to cancer on October 20, while Dallas Carter, HS0ZBI/W3PP, died in a tragic air accident when the light aircraft that would have taken him to the Bahamas to compete as an operator of C6APR in the CQWW contest crashed just after take-off on Oct 21. (For an ARRL report and tribute click here -- opens in its own web page). May these silent keys rest in peace. Standing in for RAST President Chaiyong Wongwuticomjon, Vice President Gen Prasit, HS1DN, (pictured at right) announced that the NTC had agreed to RAST's request that the amateur 40 metre band should be expanded from 7.0-7.1 MHz to 7.0-7.2 MHz, as agreed during the WRC-03 conference in Geneva and to be effective from March 29 this year. 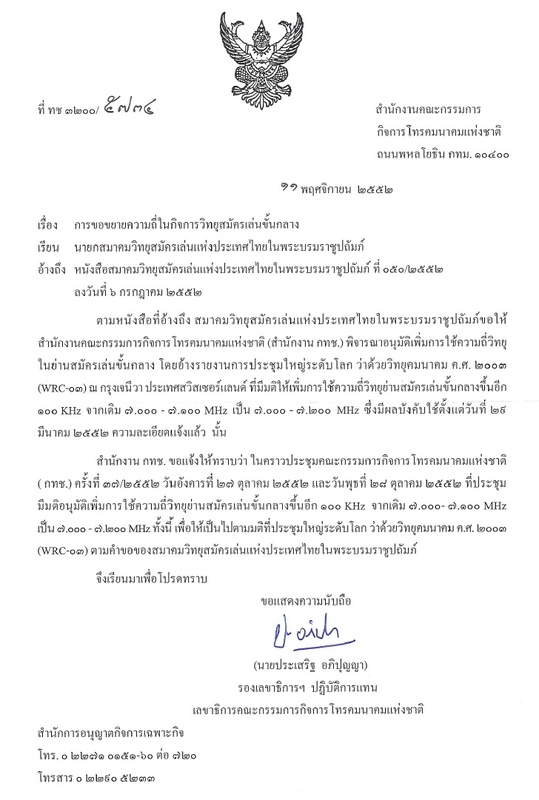 After this date passed without any announcement from the NTC, RAST wrote a formal letter to the commission seeking the 100-KHz expansion of the band and this is now available to Thai intermediate class radio hams. The decision was made by the NTC in a meeting of the commissioners on Oct 27-28 and is now effective. Details of the decision can be found in this announcement by the NTC, dated November 11 (the letter is in Thai and opens in its own web page -- thanks to Champ, E21EIC for this confirmation). Gen Prasit also announced that the society had received an invitation to participate in a disaster preparedness rehearsal in Chumphon, southern Thailand, from November 3-5, but that no one was free to be able to participate. In another invitation received by the society from the Public Health Ministry RAST Secretary General Phatanadit, HS1WFK, would represent the society by attending a planning meeting regarding disaster communications on November 3, Gen Prasit announced. Gen Prasit also explained that on the day of the meeting, RAST president Chaiyong was engaged in a RAST-sponsored kathin (merit-making) ceremony. 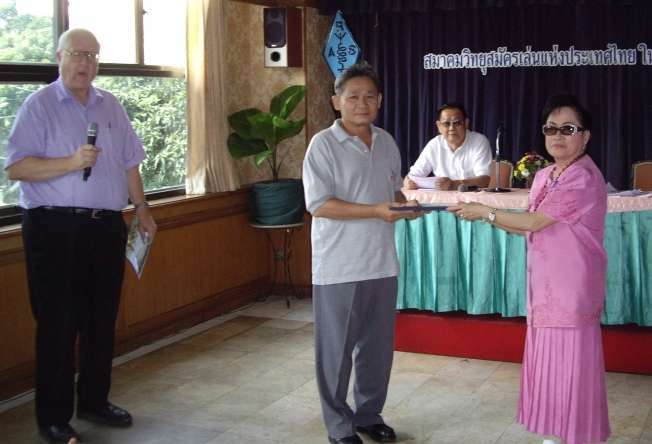 He was at Wat Donkaew, Rongkao village, Amphoe Wangnue, Lampang province, for which RAST had raised supporting funds from both RAST and from members present at the October meeting. There has been a development regarding the forthcoming intermediate class training and examination that RAST has proposed to, and which has been acknowledged by, the National Telecommunications Commission. The NTC has asked RAST to provide evidence of interest among those who would like to take this exam by providing photocopies of their licences. The society is looking at this request, and believes that interest is strong, with at least 100 would-be candidates, according to one committee member. 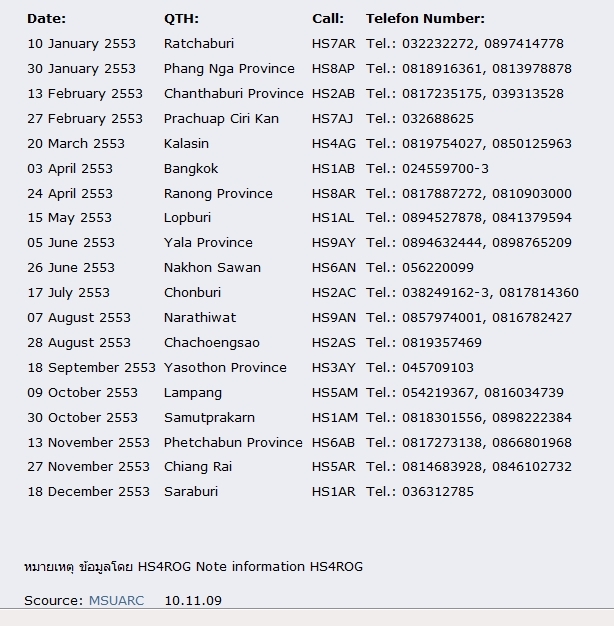 However, since Narissara (John), HS1CHB, was also unable to attend the Nov 1 meeting, follow-on action had been deferred. RAST committee members also agreed that a letter should be drafted to make clear the society's views on the radio spectrum reallocations as proposed by the NTC and reviewed in a public hearing in May this year. RAST had made its objections to several of the provisions known to NTC Chairman Gen Choochart Promprasit in a meeting on the eve of the hearing at the NTC Headquarters on May 18, with senior RAST representatives, President Chaiyong, HS1QVD, Mayuree, HS1YL, Kanchit, HS1JC, Narissara, HS1CHB, and Tony, HS0ZDX taking part. A follow-on letter should reiterate its objections and elucidate why, a committee member explained. Kanchit, HS1JC and Joe, HS2JFW would help draft this letter, it was said. Over the past month, two regional amateur radio conferences took place: the IARU Region 3 conference in Christchurch, New Zealand Oct 12-16, and the 37th annual SEANET Convention in Seoul, Korea, Oct 23-27. RAST International Liaison Officer Tony, HS0ZDX, announced that 10 member societies had attended the IARU R3 conference with a direct presence, while another three societies, including RAST, had appointed proxies. Representing RAST was the Singapore Amateur Radio Transmitting Society, SARTS and the delegate heading the delegation was S. Jothinathan, 9V1JN (Jothi). "There were 10 IARU member-societies represented in person with another three represented by proxy. 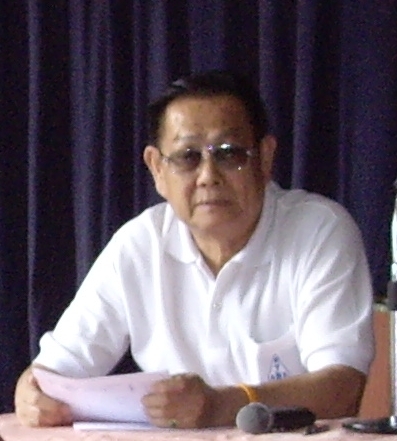 SARTS held the proxy for the Thailand Society, RAST. Also attending was the IARU President Tim Ellam and Vice President Ole Garspetad. Region 1 and 2 was also represented. "Three working groups dealing with IARU monitoring system, policy and operational issues met in parallel. A fourth working group met on emergency communications. SARTS was in the working group on policy matters that included education, training and development of amateur radio. "The important issued discussed are the emergency communications where the conference considered the concept of emergency centre of activity (CoA) frequencies worthwhile, and adopted 3.600, 7.110, 14.300, 18.160 and 21.360 MHz. are not spot frequencies, but starting points + or � 5 kHz are not the only frequencies to be used, and are not mode specific and should be considered as being "all modes". "The Conference identified the need to update and modernize the IARU protocols and procedures to effectively deal with intruders causing harmful interference in the amateur radio bands. Conference proposed a single website to more effectively collect data on intruders and to record action being taken on them. The amateur services must take action to protect their bands, the conference heard, because without complaints about an intruder causing harmful interference, it me be claimed that there is no breach of the ITU Radio Regulations. "SARTS was invited to chair the Finance Committee meeting where it was resolved all accounting be in Japanese Yen and subscription will also be billed in Yen to standardized the accounting and reporting system. There may be an increase in member society's subscription rates to meet the expenditure, issue to be taken up at the next conference. "The following were elected as Directors of IARU Region 3 for the next three years. They are Michael Owen -- VK3KI, who also was elected Chairman of Directors; Peter B. Lake -- ZL2AZ; Prof. Rhee-Joong Guen -- HL1AQQ, Gopal Madhavan -- VU2GMN and Shizuo Endo -- JE1MUI no change from previous term and Jay S. Oka -- JA1TRC as Secretary. "The next conference will be held in Ho-Chi-Minh City, Vietnam in 2012." Tony said that RAST was most grateful to Jothi and to SARTS for acting as its proxy this year, adding that hopefully, in three years' time when the next regional conference takes place, the society will be able to sponsor a delegate, especially since travelling to Vietnam is much more economical. The SEANET conference in Korea this year was well attended, with over 200 delegates participating and the majority being from Korea and nearby Japan, according to Fred Laun, HS0ZAR, who took the opportunity to visit Korea as an extended stop-over on a trip to Thailand. Also representing Thailand were Ponwat, HS1XIM, from Lampang and who had helped organise SEANET 2007 represented Thailand, along with Somporn, Fred's XYL. 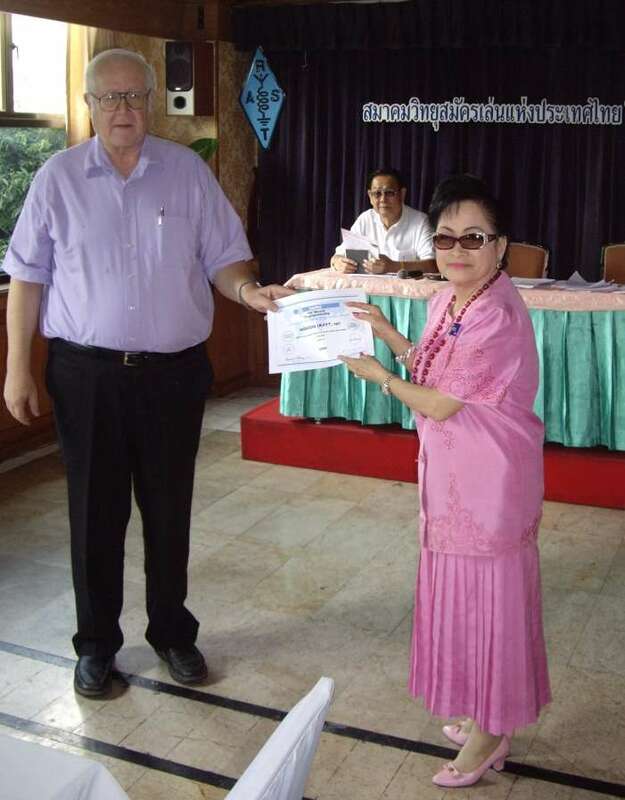 Fred brought with him QSL cards for Thai stations that had contacted the Korean SEANET special event station during the convention and also a bound certificate to the winner of the SEANET contest this year, which in the Single Operator category was Narongdej, E21YDP. Fred also praised the hospitality and organisation by the Korean hosts, which included a visit to the demilitarized zone. Mayuree, HS1YL, on behalf of RAST presents the award certificate to Narongdej during the meeting. Fred, HS0ZAR, K3ZO is standing in this picture with microphone in hand. HS0AC station manager Finn, HS0/OZ1HET, provided a report for club station activities during October, the highlight of which was a CQWW team effort by Winit, HS1CKC, Champ, E21EIC, Nathan, HS0ZHG and Swen, HS0ZFZ during which the final score with 2459 QSOs was 2,191,625 points. Finn also gave an update on his quest for a Thai-Danish reciprocal amateur radio licence agreement with the response to a letter from RAST written on mid-September and received late last month. The response, from Denmark's IT-OG Telestyrelsen (ITST), stated that Denmark's principle attitude was to support the international work within the CEPT, and not to make reciprocal agreements with other countries. It also noted that he European Communications Office (ECO) was currently working on behalf of CEPT for several countries, including Thailand, to join CEPT recommendations T/R61-01 and T/R 61-02. The ITST recommended to wait for the outcome of the ECO's work, noting that if this ended successfully there would be no need for a reciprocal agreement. Finn noted that he had replied to note that he had now been waiting nearly 10 years for a solution and that Thailand appeared not ready to join the CEPT for the time being, so that the ITST should change its view and make a reciprocal agreement. He added that he would make a follow-up on this in six months' time. Champ, E21EIC, also brought with him award certificates for winners of the IARU World Championship Contest, namely Charly, HS0ZCW/K4VUD (pictured below receiving the certificate from RAST Vice President Prasit, HS1DN, at left) and Karl Renz, HS0ZDG. Vice President Prasit, HS1DN, presented the award to Charly while Honorary Past President Mayuree, HS1YL, presented the award for Karl to Fred, HS0ZAR (below, at right), who received it on his behalf. The next RAST get-together will be on Sunday, December 6 at Sena Place (directions at foot of page) from 11.30 a.m. onwards when a buffet lunch will be served. All members and any visiting hams are welcome to attend. 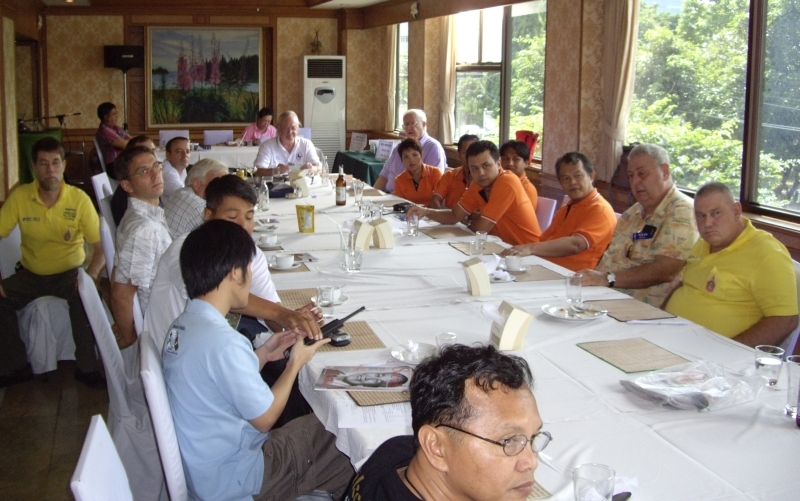 RAST plans to organise a car rally in mid-January 2010 as a fund-raiser and to also mark the New Year, with the rally ending with a banquet dinner and party at the Sri Nakarin Dam in Kanchanaburi Province. Tentatively, the event will take place on the weekend of January 16-17 and RAST President Chaiyong, HS1QVD, and officers of the society will keep members up-to-date with developments. This was decided during a committee meeting that preceded the October meeting at Sena Place Hotel on October 4 when it was also announced that RAST would be sponsoring a Kathin (merit-making) ceremony in Lampang at the end of the month. Those at the meeting were asked to make a donation towards the event that will take place at Wat Don Kaew in the northern province. A coach will leave Bangkok on Oct 30, returning on Sunday, November 1, and anyone interested in joining the trip should contact RAST President Chaiyong ([email protected]), it was announced. This package, encompassing transport, food and accommodation, costs 1,400 baht. Regarding the intermediate class examination and training course that the society intends to organise as soon as possible, it was announced that the National Telecommunications Commission (NTC) had acknowledged receipt of this request in writing and said it would be notifying RAST further about this. President Chaiyong also thanked Thida Denpruktham, Editor of 100 Watts magazine and an advisor to RAST, for presenting a plaque congratulating the Japan Amateur Radio League (JARL) for organising the Tokyo Ham Fair when she visited the event in late August. In other announcements, members heard that the Ministry of ICT had invited a RAST representative to participate in a disaster rehearsal exercise in Chumporn province between Oct 6-10, organised by the National Disaster Warning Centre, while the Government's Public Relations Department has invited RAST to join a meeting on October 9 to participate in a UNESCO world audio-visual hertiage meeting. Charly, HS0ZCW, who is a lecturer at Mahidol University where he teaches the art of film-making, volunteered to attend this meeting on behalf of the society. Chaiyong said that following the October RAST meeting he and several officers of the society would be travelling to Siriraj Hospital to wish His Majesty the King a speedy recovery from his illness and he invited those present to join the group if they were free to do so. The next RAST meeting will be held at Sena Place on November 1. The August meeting of RAST saw a big turnout in anticipation of the awarding of certificates for the winners in different categories of the 2008 CQ Worldwide VHF and IARU HF contests, with the certificates and much of the activity being organised by Champ, E21EIC, Thailand's CQWW VHF contest coordinator. Those present at the Sena Place Hotel on Sunday, August 2 also learned that RAST hopes to present a letter to the National Telecommunications Commission (NTC) later in the month seeking permission for the society to host an intermediate class amateur radio training session and examination. The date of such an examination, which has not been conducted in Thailand for several years, would likely be in around two months, depending on the response from the NTC, according to RAST President Chaiyong Wongwuticomjon, HS1QVD. The question bank for the intermediate class examination is almost complete, according to Kanchit, HS1JC, who has been co-ordinating this work, while the NTC should send representatives to oversee the examination. There were many old and new faces at the meeting, several of whom were to receive certificates for their showing in last year's CQWW VHF contest. New visitors included G3MMA, Dennis, who had been first licensed in 1957, while HS1FRU was returning to a RAST meeting for the first time in 17 years, noting that the last time he had attended a RAST meeting it was for the AGM in 2535 (1992). Members also heard that RAST Secretary Phat, HS1WFK, last month had been appointed to a Ministry of Industry committee for societal security, following his work helping to draw up the ISO/TC 223 Standard on societal security management over the past three years as a member of an ISO working group. Chaiyong explained that Phat had also proposed a role for amateur radio to play in helping to maintain societal security. August 4, two days after the meeting, would be National Telecommunications Day in Thailand and RAST had been invited to join many government departments to an early morning ceremony at the NTC Headquarters building on that day. The CQWW VHF results can be seen below and many certificates, organised by Champ, were presented by senior officials of RAST, including President Chaiyong, Vice President General Prasit, HS1DN, David Furman, HS0ZDP and Tony, HS0ZDX along with representatives of sponsors, including Winit, HS1CKC (Siam DX Group) and Martin, HS0ZED of the Golden Kilowatt (GKw). In addition, certificates were presented for the winners of awards for the IARU HF Championships in 2008, which were for Charly, HS0ZCW, for Champ, E21EIC, and for HS0AC, the RAST club station. 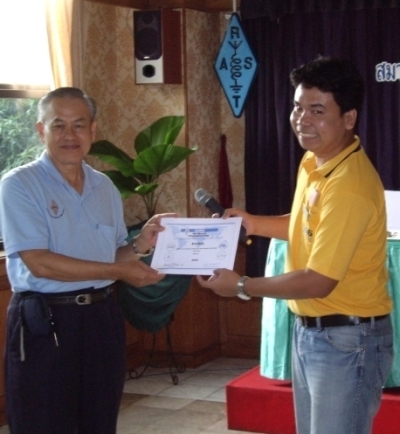 while at right RAST president Chaiyong, HS1QVD, presents a certificate for the IARU Championships to Champ, E21EIC. Sponsors: RAST, 100watts Magazine, Siam DX Group, TAMSAT Group and GKW. 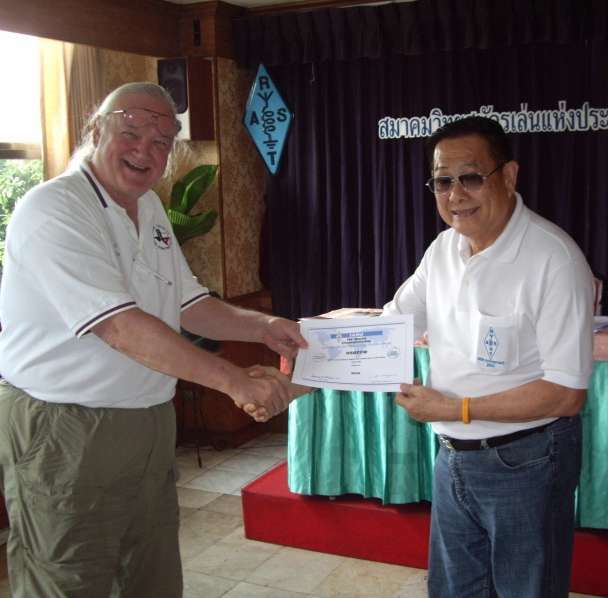 Winit, HS1CKC, presents an award to winners in a group entry in the 2008 CQWW VHF contest. Contest co-ordinator Champ, E21EIC, makes the announcement at left. Tony, HS0ZDX, also announced that S. Jothinathan, 9V1JN, the Singapore Amateur Radio Transmitting Society delegate to the IARU Region 3 Conference being held in Christchurch, New Zealand in October, has formally accepted to serve as the RAST proxy-holder at the meeting. This has been formally agreed upon and acknowledged by the IARU Region 3 Secretary and Nathan says he is honoured to be the proxy for RAST and adds: "I will use your vote for the best interest of Amateur Radio". Towards the end of the meeting, Kamol, E20EHQ, gave a brief account of how the automatic packet reporting system (APRS) had been demonstrated in use on an aircraft that he had flown at Don Mueang in late July during the 2009 Civil Aviation Exhibition, demonstrating how private pilots could use this two-way digital communications system, and it was suggested that RAST could provide these pilots with training to become radio hams so that they could take advantage of this. Kamol also thanked Goi, E20NKB for providinjg the digipeater station and the Internet gateway for the demonstration.